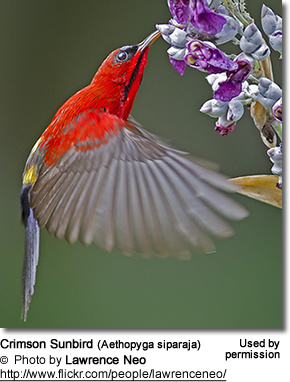 The Crimson Sunbird (Aethopyga siparaja) - or Yellow-backed Sunbird - is a tiny sunbird that occurs naturally in tropical south-eastern Asia from west-central India to Indonesia and the Philippines. They are typically found in forests and plantations. This is the national bird of the Republic of Singapore. Range: Malay Peninsula (south of Narathiwat), Anamba Is (east of Peninsular Malaysia), Sumatra (except Aceh) and satellite islands, and Borneo and associated small islands (except Natunas). Crimson Sunbirds average 11 cm or 4.3 inches in length. They have medium-length thin down-curved bills and brush-tipped tubular tongues, both adaptations to their nectar feeding. 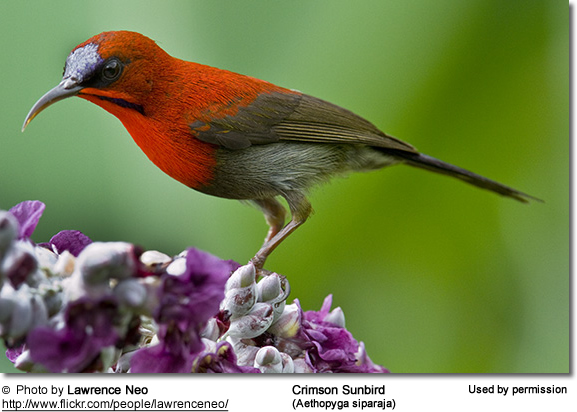 The adult male has a bright red throat, chest and sides. He has deep blue moustachial stripes. His back is maroon-colored, his rump is yellow and his abdomen is yellowish-olive. He has a bluish-green tail with white tips to the outer tail feathers. 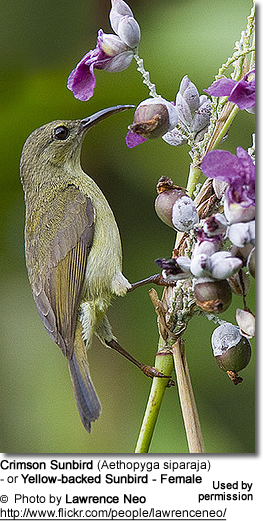 In most of the range, the males have a long green-blue tail, but subspecies Aethopyga siparaja nicobarica from the South Nicobar Island (Great and Little Nicobars, Kondal and Meroe Islands) lack the long central tail feathers. 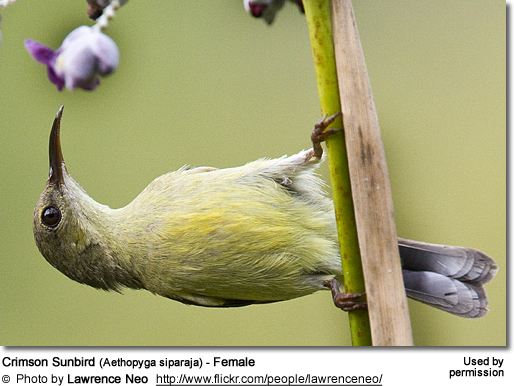 The adult female has an olive-green back, yellowish chest and white tips to the outer tail feathers. 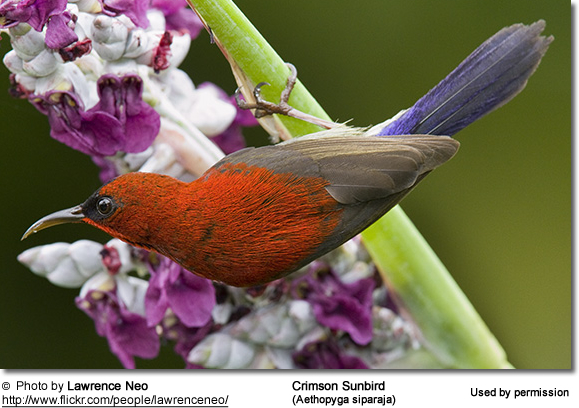 The Crimson Sunbird male and female build the purse-shaped, moss-covered nest together - although the female takes on the part of lining the nest. The nest is often suspended from the underside of large fern fronds, or thin branch of a low tree or shrub. The average clutch consists of 2 - 3 eggs which are mostly incubated by the female for about 18 - 19 days. The male assists with feeding the young. Its call is described as a chee-cheewee. 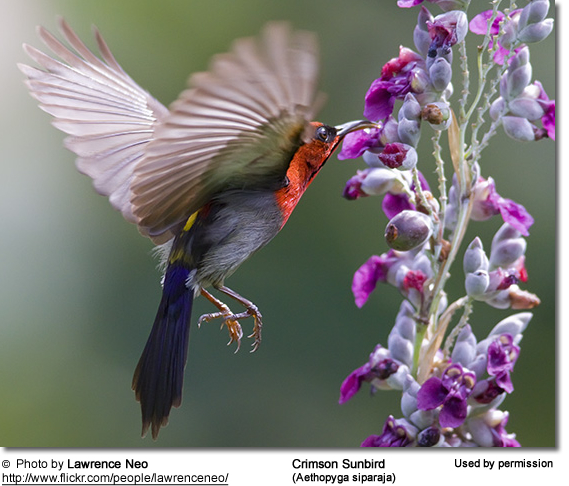 Crimson Sunbirds mostly feed on nectar, although take insects particularly during the breeding season to feed their young and to satisfy their own need for increased protein in their diet during this demanding time. They favor flowers with the highest sugar content and seek out those areas containing flowers with high energy nectar. The males establish feeding territories on flower bearing shrubs and trees, which they aggressively defend. 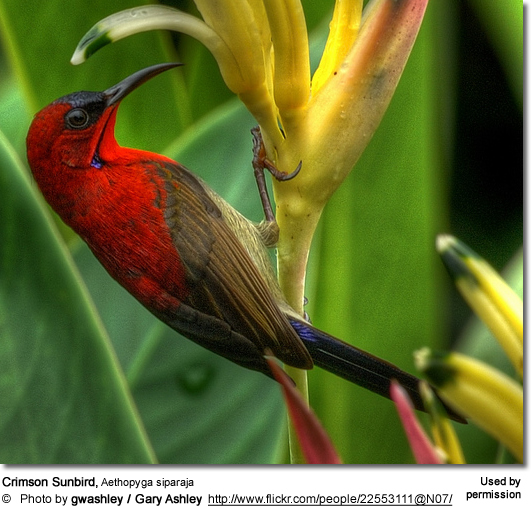 Many native and cultivated plants on whose flowers sunbirds feed heavily rely on them for pollination. The mostly tubular-shaped flowers actually exclude most bees and butterflies from feeding on them and, subsequently, from pollinating the plants.